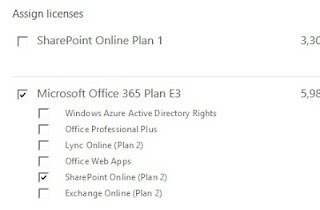 You can use PowerShell to create users in Office 365 and assign licenses to them. New-MsolUser -UserPrincipalName "amin.tavakoli@mydomain.onmicrosoft.com" -DisplayName "Amin Test1" -FirstName "Amin" -LastName "Test1" -UsageLocation "GB" -LicenseAssignment "mydomain:ENTERPRISEPACK"
You may want to assign specific licenses within a SKU rather than assigning the whole E3 license. In that case you need to create your own license assignment option. To do that we first need to see what the service plan IDs are for each individual service within the E3 SKU. 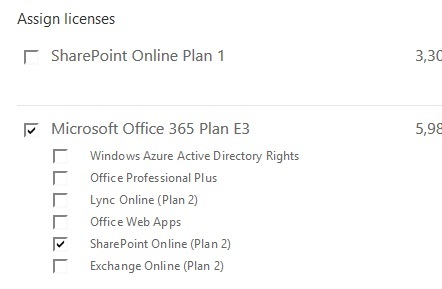 As you can see we still set the AccountSkuId to "mydomain:ENTERPRISEPACK", however using the DisabledPlans switch we are disabling all the other service plans, leaving SharePoint Online only. Great explanation! It's helpful to someone trying to figure this out.